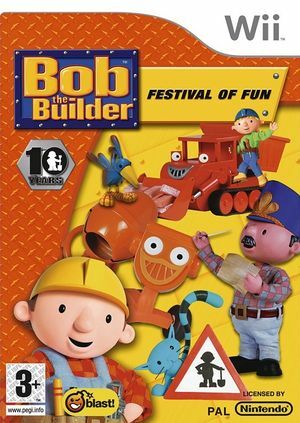 In Bob the Builder: Festival of Fun it’s summertime in Sunflower Valley. The community project is going so well that Mr Bentley has suggested a festival to celebrate. There will be food and music and fun for everyone! Bob and the Can-do crew need to clear the area and build the stage for the event. Everyone in Bobsville is invited to come and help - even Spud! Help Bob and the gang complete a variety of challenges to make the festival a success! Enjoy a vast array of fun and diverse story-based challenges and build with up to three friends in numerous exciting multiplayer modes. Play competitively or join forces with a friend to get the job done! The graph below charts the compatibility with Bob the Builder: Festival of Fun since Dolphin's 2.0 release, listing revisions only where a compatibility change occurred. This page was last edited on 12 October 2017, at 22:23.